Yesterday Microsoft unveiled its Web email client with Outlook, sounding the soft death knell of Hotmail and ushering in a new era for its online products – all wrapped up in Metro goodness. The early demand has been good: Within the first six hours of availability, Microsoft reported that a million people had signed up for the new Outlook. Of course the term “Gmail killer” has been uttered before, and you can’t go a week without hearing about how some startup is going to “fix email,” so any skepticism about Outlook’s launch is warranted. We go hands on to check out everything the new Webmail client has to offer – and while anything has to be an upgrade from Hotmail, the email bar is being set progressively higher. For all Windows Phone’s faults, its user interface and design have been nearly universally loved. It’s safe to say that largely, Metro has been a success, even if the operating system hasn’t been. Outlook is yet more evidence that Metro translates well to the browser. Sure, there’s a massive amount of white space, but it’s where I want it to be. Or rather, it’s not where I don’t want it to be: On the margins, shoving all the content I actually care about into a long stream down the middle. 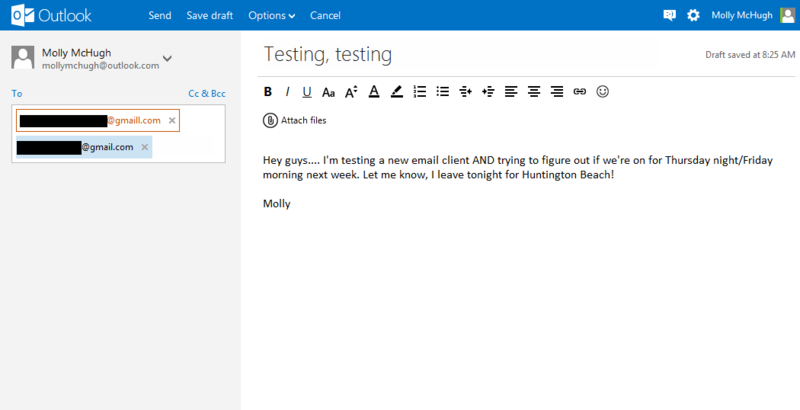 The Outlook icon serves as a navigation hub, pulling up your Mail, People, Calendar, and SkyDrive tabs. Right now, Calendar and SkyDrive haven’t been converted along with the new Outlook, but People bears the upgrade. In addition to just being a beautiful, uncluttered interface, there are some really useful in line controls that speed up the email process. Hovering over a message offers quick commands like trash or flag. Checking the box of an email automatically brings up a dash on the banner, displaying nearly everything you could want to do with it immediately, instead of using drop downs for sorting. It all makes it feel like you’re doing far too much clicking inside Gmail, that the process there just has too many steps. This isn’t helped by the fact that the interface is altogether much busier, of course. But to give Gmail its due, it has a much more sophisticated and immediately visible labeling system. 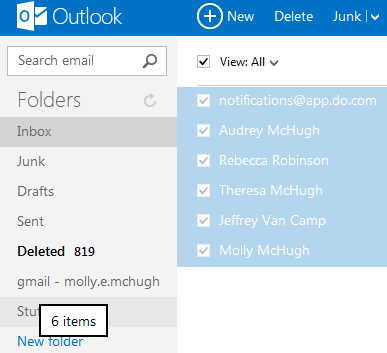 With Outlook, it categorizes your inbox for you. For instance a notice from Facebook is considering a Social Update, and email containing pictures is marked Photos. And while I can get to these messages via their designations, I can’t just look at my inbox and automatically know what’s what like I can with Gmail. Outlook contains all the functionality of your average Webmail client, but there are a couple of things worth pointing out here. For starters, sending and receiving attachments. You get 7 GB of storage with SkyDrive, that means you can send someone a massive file without overloading their inbox; it works much like sharing using Google Drive. Receiving attachments also offers a view option so you can see it without downloading. And Photos are exceptionally well done: Outlook creates a lightbox slideshow of the images that pops up over your inbox for you to click through. A handful of useful prompts — like indicating you haven’t added someone to your contacts list — were subtle and useful at the same time. Simple tasks like relying, forwarded, CCing, etc are intuitive, as they should be. This is email, not rocket science. The interface makes it an especially nice experience, though, without any distracting sidebar information tearing you away from the message at hand. You can create folders to designate mail into, but like I said the filtering system is pretty pared down, although that’s in comparison to Gmail, which is quickly becoming a power user application. Outlook has made an interesting choice with display ads. They sit on the right-hand margin of your screen, all courtesy of Bing Shopping. In Gmail, ads are only surfaced when you’re inside an email along the right-hand side, otherwise, they sit in almost unnoticeable banner links on the top of the page. Outlook is going the opposite route, hiding ads once you’ve open an email and showing them when you’re just in your inbox. And unlike Gmail, it’s not scanning email bodies, just subject lines and sender addresses. I’m honestly not sure with method I prefer, although I’ll say the uniformity and minimalism of Outlook’s design here is better and that if you open Facebook Chat, you can hide ads altogether. Bing has become increasingly social, relying on that Microsoft-Facebook partnership to weave the network into search as much as possible. As you might expect, Outlook is no exception. You can connect your Facebook to the account both to pull contacts as well as enable Facebook chat, the latter of which is actually a preferable way to use the feature. 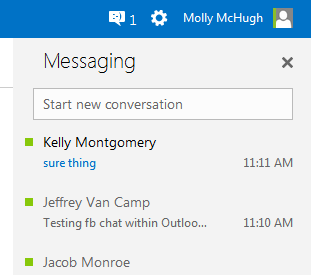 Facebook Chat has been incredibly popular although lacking, and packaging it in a Metro UI is a nice touch. You’ll get a pop out alert when someone responds to you and a drop down will reveal all of your Facebook friends that are online. There were a couple glitches here, however. After trying to X out of a conversation, I was instead bumped out of Messenger entirely. And after exiting and jumping back in, all of the text from my conversations went missing. I’m willing to chalk these up to the launch day/day after troubles, because otherwise it’s a really nice feature. Unfortunately there is no answer to Gchat: While your Facebook friends are there, you can’t chat with Gmail contacts – which for some of you, means Outlook is in “no deal” territory. A quick easy way to send info to your email contacts is incredibly efficient and right now you can’t do this. Maybe as Outlook amasses users, that functionality will be added, but at the moment, it’s Facebook or bust for instant messaging. Not all change is good. On the whole, Microsoft has done an admirable job making Outlook simple and fluid, but there are a handful of under the hood hang-ups that are worth mentioning. For one, connecting your other email accounts isn’t as easy or usable as it should be. Since I’ve been using Gmail for going on five years now, I obviously wanted to connect the client so I could be up and running with Outlook as quickly as possible. Thankfully, Outlook has a prompt front and center to help you get rolling wit this task. After entering my Gmail address, I went over to Gmail, verified to connect the two. Upon logging back into Outlook, there was a tab for my Gmail inbox… only nothing in it is up to date. The newest email is from 2010, and rest assured I’ve received emails within the last two years. When I checked out the add accounts tab, I had a message from Outlook that basically said “you have too much damn email.” No kidding, Outlook. So if you want to connect an account you’ve been entirely reliant on for years, you could encounter this issue, rendering it substantially less useful. Also, if you want to edit your profile, there’s no way to get back to Outlook. You’re suddenly stuck in the horrible Windows Live interface with no link back to whence you came. Hopefully all Microsoft Web products are going to get the Metro treatment, though, and unify the experience. Outlook is a great Webmail client for the 99 percent. There are plenty of kinks that need to be ironed out at the moment, but it’s surprisingly sophisticated as is. Gmail has become increasingly complicated and feature full within the past couple of years, and while that’s great for some users, it’s overwhelming for many, many others. It’s definitely time for some clean up there, but meanwhile, Outlook makes a compelling argument for you to switch on over – and enjoy those brief moments of inbox zero.